6 inch flowers. 38 inches tall. Up to 20 buds per scape. Early Mid Season TET EV. Custard yellow petals (RHS 3k6A) with dark maroon eyes (RHS 59A). 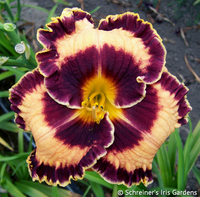 Very wide maroon and yellow double edge. Flower is full formed, opens perfect, and performs well. Double branching. Sure to please.